Recently I read The Cartographer, by Peter Twohig, a kind of Boys' Own adventure set in (and under!) the streets of Richmond in the late 1950s. The eponymous 11 year old hero makes maps of his world: dangerous houses, enticing warehouses, mysterious tunnels, haunted parks. I tried to match up his maps to satellite maps of present-day Richmond, without much luck; but a 1977 Melways directory provided more clues. I found the power station, the factories and tram depots that the Cartographer described -- all gone now. Coincidentally, one of the next books off my pile happened to be Deborah Forster's The Book of Emmett, and while the tone this time is darker and more adult, the decade the 1970s, and the suburb Footscray, the theme of a remembered Melbourne childhood continued. Perhaps because the setting was more recent, I recognised more landmarks: the Western Oval, the narrow streets of Footscray, the Chinese restaurant Poons where I've had lunch. Last week Michael went for a wander around Cheltenham, the suburb of his 1970s childhood, and found lots of changes. The old tip is now a housing estate, the sprawling streets were he played cricket with neighboring kids seemed shorter, the shops he remembered had merged into each other or disappeared. And then yesterday we drove through the Melbourne University precinct and I didn't recognise it. All these big new buildings, the Business School and the blocks of student apartments -- the shabby streets of my university days have all but gone. It doesn't take long for an urban landscape to alter utterly. And then the only places we can find those landscapes in is our memories and our dreams; or in the pages of other people's books. There are many ways of experiencing a football match. In the few brief years that I've been a Western Bulldogs member, I've seen our team play many times in a half-empty, roofed stadium. Sometimes I've been in a big group of extended family; once or twice, I've sat alone. It's not always a soul-less, depressing experience; a few weeks ago, I was perched above an astonishing goal from wunderkind Marcus Bontempelli, and the whole crowd rose to their feet as one, cheering. Late last year I was present during a regrettable (ahem) melee when a spine-tingling chant slowly growled from the crowd: Bull...dogs...Bull...dogs... We don't do that a lot; it was spontaneous, thrilling, tribal. I've also seen the Doggies play in the tropical warmth of the Gold Coast, the bitter chill of a Canberra winter, and at the icy Hawks fortress of the Launceston ground. I've seen footy at the MCG (not often, and a long time ago, when we still played finals occasionally), and even, in ancient days, once, at Waverley (my first footy game, St Kilda versus someone, and mist hid the play on the other side of the ground). I've watched matches on TV, in the comfort of my lounge room, where I can swear and pace up and down and even run to another room if the strain proves too much. I've listened to games on the radio, busily scrubbing down the kitchen cupboards to calm my nerves. I've hunched over games on the tiny screen of the iPad, sitting in bed, squinting at the poor resolution and hoping my fellow spectator won't lose his temper and hurl the device across the room. But I have a new favourite way to watch football: the old-fashioned way. This year the Western Bulldogs have started their own VFL team, and they play some of their games at the Bulldogs home, the Whitten Oval in the heart of Footscray (the team is called Footscray, too). Last Sunday we went along. The sun was shining; we took a picnic rug and sat on the grass in the forward pocket (see above). We ate gourmet hot dogs and chips, bursting out of a paper bag -- twice the amount and half the price you'd pay at Etihad. At half time, kids and parents rushed onto the oval and footies flew in all directions. We took the dog, and walked her around the ground, and she made friends with other dogs. There were two or three thousand people there -- enough to hear a decent roar when a goal went through, not so many that you felt cramped or overwhelmed. An injured Bulldogs player hobbled up the hill on crutches and sat on the grass behind us (he signed our football). It was intimate and friendly, relaxed and fun. And suddenly I understood: this is what football used to be like, before the corporates got hold of it. This is what everyone is nostalgic for! But you don't have to be nostalgic: because it's still there. NOTE: I planned to write this post all week. But quite coincidentally, last night I started to read The Book of Emmett by Deborah Forster. And lo, it's set in Footscray. The very first scene takes place in the shadow of the Whitten Oval! Synchronicity strikes again. Inspired by my fellow book group member, Judy, who was exuberant about her recent re-reading of Heidi, I dug out the copy I acquired years ago and I've started re-reading it myself, simultaneously reading it aloud to my older daughter (she seems to like it so far). Sometimes it feels as if my reading diet consists of torrid YA, pretentious literary fiction and ponderous non-fiction. 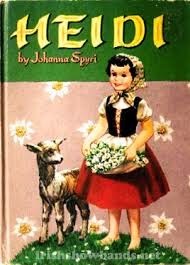 Reading Heidi is like taking a draught from a refreshing Alpine stream, or a nourishing bowl of fresh goat's milk. But I have to confess that my love of Heidi originates from a less-than-pure source. I didn't read the original (in translation) until I was an adult. 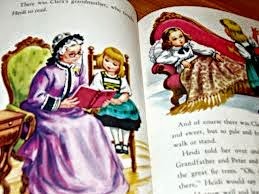 The Heidi I adored was actually a Little Golden Book, which I think might have been based on the Shirley Temple movie version -- looking at Heidi's very inauthentic golden curls in the illustrations*, I suspect this may have been the case! 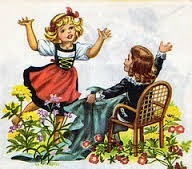 The Heidi of the Johanna Spyri book is dark-haired and lively, while Clara is fair and languid. There were two elements of the LGB version of Heidi that particularly appealed to me, and perhaps this shows what a sedentary child I was. The first thing was Heidi's dear little bed in the hayloft; the other was Clara's couch (Clara being too feeble to walk). By a happy chance, my grandmother had a chaise longue in her house which was exactly the same shape as Clara's. One of my favourite games was to drape a blanket over my legs and pretend to be Clara. Ah, bliss, to lie on a couch all day and read! The absolute simplicity of Heidi's life with the Alm-Uncle, their sparse possessions, and the beauty of their mountain home, is still wonderfully appealing. There is part of me (the part that goes to yoga camp) that loves the idea of living in a cottage halfway up a mountain, with only wildflowers and goats and the wind for company. But I bet I wouldn't like it much when it snowed.